Toddlers go through a lot of stages as they grow and navigate their world. Some are fun stages, like saying new words and learning to jump or run... and some are annoying and frustrating stages, like hitting and running away, and throwing things. My toddler started going through a hitting phase not long ago. Hitting siblings, friends, and me. Today I'm going to share some of the basic strategies we've been using in our home to help decrease hitting. First off, I think it is important to try and understand any behavior. As I mentioned in my review of the book No Bad Kids: Toddler Discipline Without Shame, I truly believe that there are no bad kids... but there are kids who need help and need to be taught... and that is our job as parents and educators. My preschooler is highly emotional and has a lot of anxiety. This means that when her little toddler brother hits her she gives an amazing reaction- running, screaming, yelling, etc. I think my toddler finds the reaction fascinating so sometimes he just provokes my preschooler. 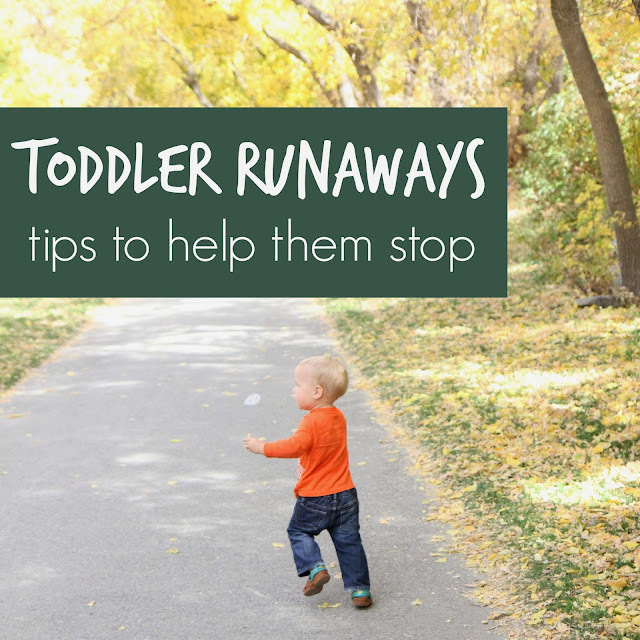 Often in new settings and around new friends and adults my toddler will just hit to find out what will happen. Will that adult react the same way my mom does? Will that kid react really emotionally like my sister does? Will mom be consistent when she reacts? I obviously don't know what is going on in my son's little head, but he loves to explore and test limits in new situations. I find that when I consistently respond in the way that I will explain later on, his interest in hitting decreases. Although my toddler has a lot of language, sometimes when someone grabs something from him his immediate response is to hit or grab back... instead of saying something. 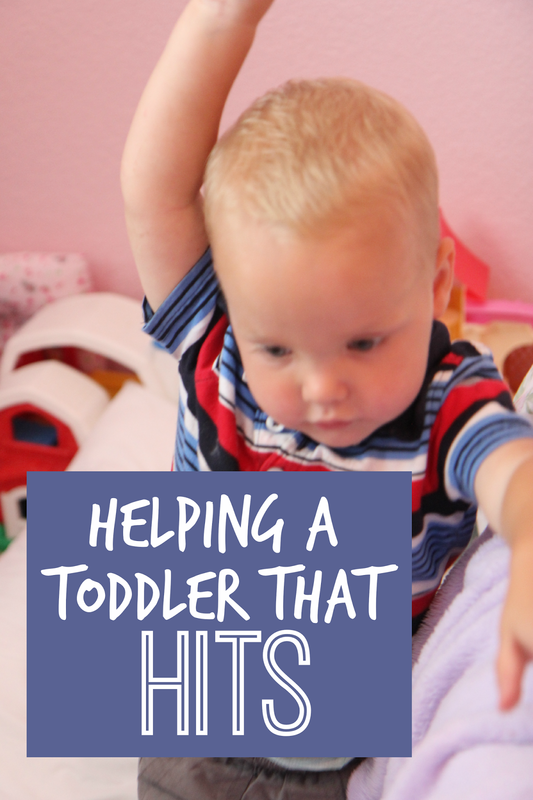 Toddlers are still working on self control and I think sometimes just hitting is a quick way to communicate and try and fix the situation and get it back to how they liked it. My toddler will also sometimes hit his siblings if they are watching a show or playing something and he is wanting them to play with him instead. Teaching him to say, "come play with me" or "can I play with you?" has helped tremendously. Toddlers don't usually have expansive vocabularies and aren't running around saying, "You made me frustrated when you took my toy, give it back," or "I'm mad at you." Often hitting is a way to express that mad or frustrated emotion physically because they don't know the appropriate language to use or are still learning it. As an adult sometimes my emotions overwhelm me and I'd rather just punch a wall instead of talking... but I'm an adult so am able to reign it in. Kids don't have as much control and need to be taught appropriate behavior or things to say. These are only some of the reasons kids hit. Kids also can hit when they are overtired, hungry, overstimilated or having a sensory overload... just to name a few. Have any other reasons to add? How Do I Deal With Hitting? One of the most important things I try and remind myself about with toddlers is that they are still learning! It is my job to teach them and help them be successful. We choose to use positive discipline in our home (though I am not always perfect and definitely slip up from time to time). We don't use time out with my toddler or a naughty step or any corporal punishment. I loved this point shared in a recent free Positive Parenting Solutions webinar I attended. Amy McCready explained that punishment causes kids to shut down, so they aren’t learning anything, they are only trying to avoid further punishment. Amy also shared that the word "discipline" means to teach. A good discipline strategy "teaches" the right behavior. I think about these reminders anytime I am tempted lose my cool at my kids. I try and ask myself, “What will yelling [or ____ (fill in the blank with anything else)] teach them?” Usually it reminds me that yelling or punishing will cause them to shut down. They won’t be motivated to do better. They will just bottle up all of their emotions and then explode later. They will also want to avoid me and won’t feel comfortable with me… which is not what I want. Instead of spending time saying, "no hitting" I spend a lot of talking talking with my toddler about what I want him to do INSTEAD of hitting. I give him strategies and suggestions to use when situations pop up. We talk about using "gentle hands" when we get frustrated or a friend takes something or wants something of ours. We talk about saying, "Can I have a turn when you're done?" and then waiting instead of hitting someone when we want the toy they have. We also practice saying, "I'm mad!" when it is obvious my son it hitting because he is angry. We also practice taking a cool down. If my son is really frustrated and is starting to hit I will say, "Wow! You're mad! Do you need to take a cool down?' For him a cool down means that he will go and find a place by himself to play and just chill out (usually his room or our guest room or just the couch to look at a book). Taking a cool down isn't punitive, but it is just an option for him if he is frustrated. I will also say, "You seem upset, do you need a hug?" or I'll even ask, "What do you need?" and sometimes he'll have an answer for me. Whenever my toddler is gentle around friends and using words to communicate INSTEAD of hitting I try and make a big deal about it and give him lots of attention for it! On days when I react emotionally to his hitting and get angry the hitting increases. If your child is going through a hitting stage one of the most important things to do is stay close by when the child is in a group of other kids or with siblings. By being close by you can watch interactions and intervene before a child gets hurt and offer a strategy instead of hitting. I like to think of myself as my child's coach during the toddler years. By being close by to cheer and teach I can help him learn new skills and help him apply them in real settings so that he understands. Saying, "I won't let you hit" and being close by to stop a child from hitting a friend is much nicer than having to run across the room to intervene too late. It is hard to teach things to toddlers out of context because their attention spans can be so short. By staying close by and helping kids practice skills like communicating, waiting, being gentle, and turn taking, they eventually start applying the skills more and more and you can move further and further away and give them more independence! Being consistent is so important and yet SO HARD. My moods and the amount of sleep I got the night before and even what I've eaten can impact how I react to challenging kid behaviors. By being consistent we help kids figure out their boundaries and help them feel secure. When my son starts hitting I will consistently remove him from the situation and remind him that in order to ___ (fill in the blank- play toys with friends, etc.) he needs to have gentle hands. Sometimes we'll wait a few minutes together away from the other kids and then I'll let him try again (with me close by). Sometimes we end up having to leave the fun event we are at and I let him know that we can only play and have fun with friends when we are touching friends gently, not hitting. Sometimes that leads into a giant tantrum but I will just pick him up and we will leave. I try and alert him ahead of time that we will stay at the fun event as long as he uses kind words and gentle hands with his friends (and doesn't hit), that way it isn't a surprise when we do leave. As I am more and more consistent I find that the amount of hitting decreases significantly. 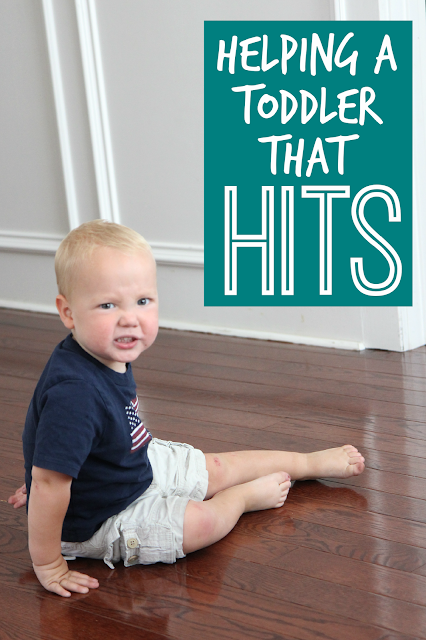 A few weeks ago my toddler was hitting constantly and now it is much more infrequent. For a week or so I was incredibly frustrated and really doubting myself and these positive strategies but as I kept plugging along and remained calm and consistent and it has finally started helping. Hooray! 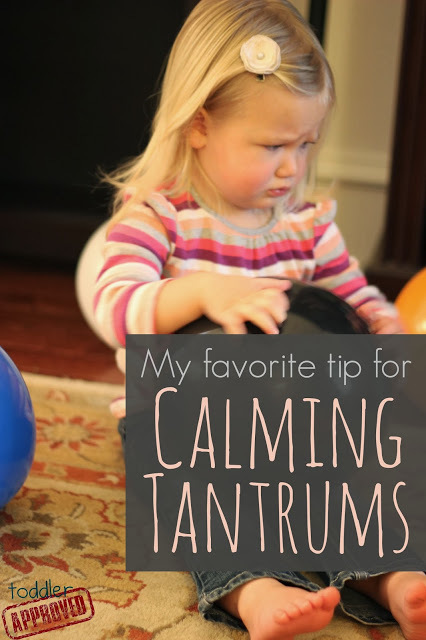 These are some of the strategies I've used with toddlers when they've gone through a hitting stage. If you use any additional positive discipline strategies I would love to hear what has worked for you! Please note: I am not a parenting expert! I am however a parent and an educator. Many of the strategies I use have come through my experiences working with challenging students and my own three children. I also read loads and loads or parenting articles and books and then pick and choose what works for me and my kids. Each child and family will be different. Over on my Becoming a Better Parent pinterest board I share a variety of parenting resources that I have found useful. I know that I don't apply every single technique or strategy perfectly, but I try and fail and try again and that is what I think continues to help me grow and learn as a parent! If your child is in a hitting phase, I hope some of these ideas and strategies work for you! If you have additional strategies, please share! I will definitely use these strategies in my classroom. Hi, thank you very much for advices! I am always seeking for new ideas how to solve problems with my two kids. I am just wondering what do you say to other parents if you decide to leave the party or any gathering where your child is having a tantrum? Do you have to explain something or perhaps everyone understand your behaviour without words? Though parent groups are also different and you through your acts are building relationship with other at some point. Looking forward your answer! So what do you do when you've been trying these techniques for months and they haven't helped and your toddler is hitting a particularly sensitive (physically and emotionally) siblling? How do you react specifically when your toddler hits the sensititve sibling? My daughter is very sensitive so I would make sure when my toddler was with my daughter during this stage I was close enough to intervene before my son hit her. I would intervene and physically help him use a gentle hand or appropriate language or I would divert his hands to something else.I would then give him lots of positive praise and attention for doing the appropriate behavior. It is really hard to stary near by all the time as a parent, so I would also take one of the kids with me if I needed to leave the room. If the sensitive child is giving a huge emotional reaction when the hitting child hits then the hitting child often is excited by that reaction and continues to hit. By intervening and giving the hitting child positive attention and an enthusiastic reaction for using appropriate words/not hitting, you are able to help them realize that hitting isn't that exciting/fun. Thank you so much of these tips! I am also getting frustrated with my son (age 5) constant hitting and pinching of his siblings. Only thing that I have been able to do is to force him apologise every time for the person that is hurt and he is doing it costantly. Though, it doesn't seem to make things any better. I will try these tips for sure! Thank you! Any advice on what I can do about an 18mth old who isn't talking who hits her baby (2mth old) sister often when I'm breastfeeding and can't just stop to deal with her? I know she is doing it because she is frustrated and wants my attention and has no other way of communicating her emotions but she will also hit her randomly when I'm playing with her so she has my attention. At these times I think it may be to get a reaction out of the baby who is lying there doing nothing but I'm at my wits end on how to stop it. How do you handle it when it's happening at preschool? I talk to him so much about it that I can tell he shuts down as soon as I start again. We have talked about things he can do instead of hitting- walking away, waiting his turn, politely asking the other kid to stop if they're doing something to him, and/or go talk to the teacher about it. All I get at pickup is negative feedback and school is becoming a drag for me as much as for him. Ask to have a meeting with the teachers/staff to come up with a plan and discuss how they are addressing it and teaching him. Preschoolers are still so little and need reminders/help from teachers. Just telling the parent at the end of the day and hoping they will "fix it" at home will do nothing. If your preschool teachers are unable to help your child you might want to consider a different school. Teachers should be on your team to HELP your child, not just tattle to you about his behavior. Possibly having a teacher shadow him for a few days and try and watch for triggers could help. If the teacher isn't willing, you could possibly see if you can go and volunteer and see what is going on. If you or a teacher are close by and your child begins to hit (or seems like he might) you can easily help redirect him. All of the things you mentioned above are very hard for a preschooler to remember when he is agitated and he starts experiencing strong emotions. Having a visual reminder might also help. My 21month old toddler doesn't hit, but when she is mad or frustrated she pinches with her two tiny fingers, aiming for the most vulnerable spots e.g. the neck! We absolutely do not do this at home, nor to her, so I have no idea where she learnt that from. When she pinches I take her entire hand and squeeze it and says "No pinching", and get her to apologise immediately after once she is done crying. After reading your article I will now re-frame my words. I think "gentle hands" is a wonderful phrase, and hope this positive discipline will help her see how undesirable this pinching behavior is. Thanks again!